It’s not every day you meet a future Disney character, but Brian Affolter may very well fit that bill. Affolter, from Brentwood, is studying broadcasting with a personal emphasis on performance. A minor in business administration rounds out his academic portfolio in hopes of one day using those additional skills to make his way in the voice-over and recording industries. 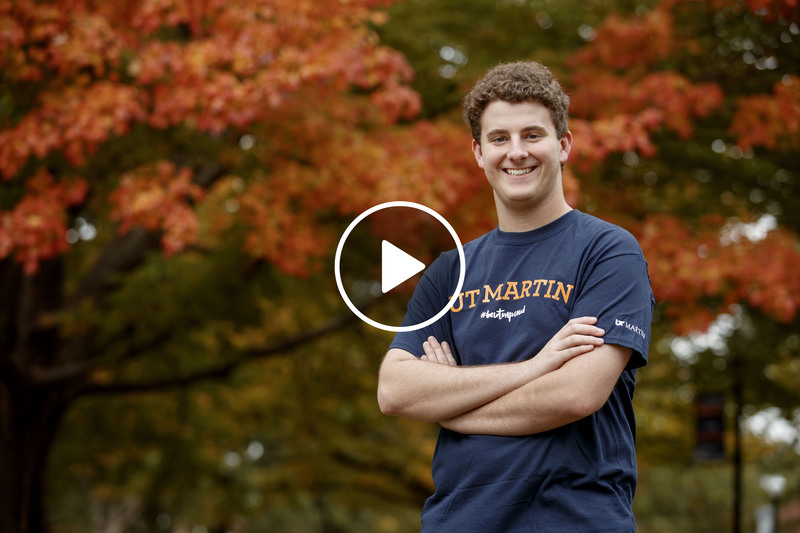 In addition to his regular academic curriculum, Affolter is also a University Scholar – the highest academic designation given on the UT Martin campus. University Scholars complete a special set of honors courses and a two-year, faculty-guided research project that serves as an undergraduate thesis, of sorts. Affolter is using his project time to learn the ins and outs of the audio production process by writing and producing his own music album. Affolter has been singing privately for years, but this is his first foray into production and recording. “There is a whole lot that goes into it, and going into (this project), I couldn’t even fathom all of those things,” he said. In addition to writing and charting original music, Affolter also needs to find musicians to learn his songs, book recording space and time with professional equipment, copyright his material and produce the final audio files. Affolter’s training in radio broadcasting and his new experiences with audio production combine well to serve his chosen professional goals. And who knows, maybe the voice of a future Prince Charming or Homer Simpson will have fond memories of his time among UT Martin’s finest.